There is no more unlimited water and the situation will get worse as populations continue to grow particularly in popular parts of the world. San Antonio, Texas is one such place. When ground water is depleted, and it will be, we will have desalinated water from the gulf. This water treatment technology has been around for many years, it works well but it is very expensive. One will be very careful brushing ones teeth. How then will we, the gardeners, garden? 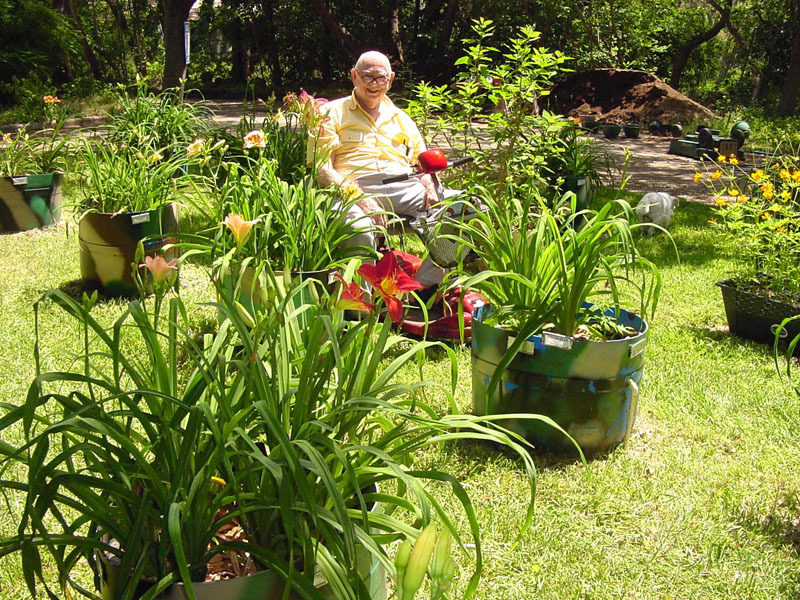 One approach is container gardening on a small or a large scale. This presentation is on the development and testing of one such system. 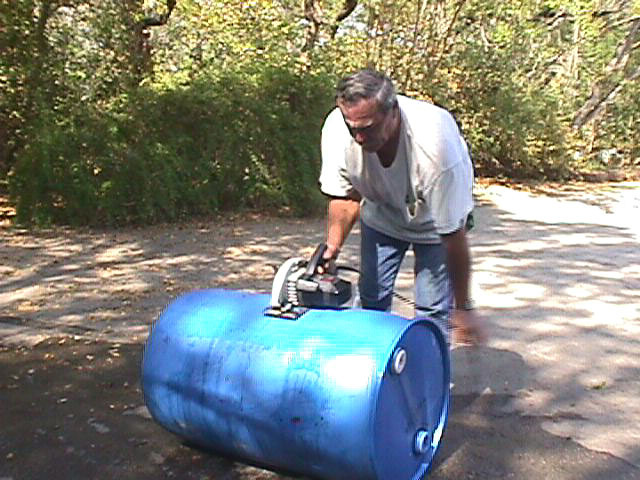 During the Y2K scare we bought some barrels from the barrel Man and stored some water and gasoline. 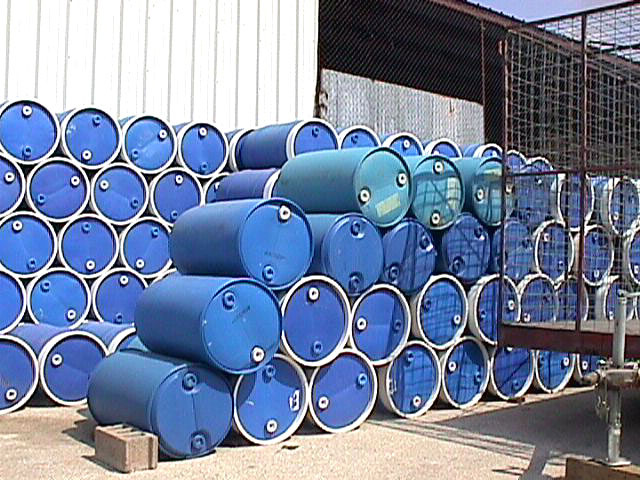 These barrels were food safe and could be considered nontoxic. 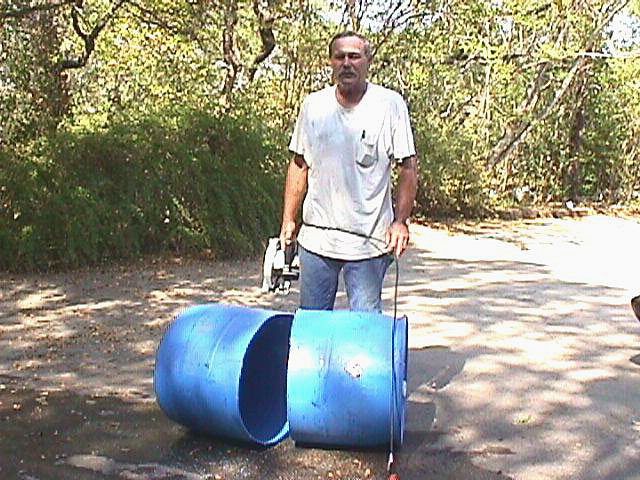 Post Y2K when the container gardening project started we cut the barrels in half with a skill saw. The barrels are made of plastic so this is no grate chore. We ended up with 49 half barrels - we don't know what happened to number 50. The plant containers (barrels) were randomly placed in an oval driveway island roughly 50 X 100 feet. Each plant container with drainage holes drilled in the bottom also had a 1/2 inch hole drilled next to the container inside wall for a vertically installed water supply pipe. 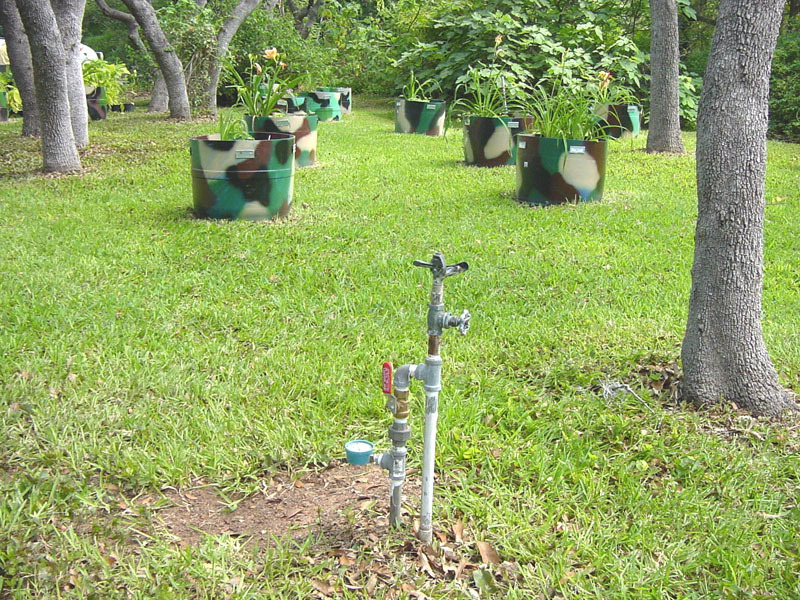 Using tees, elbows clamps, hose and flow hose each container was outfitted with it's own watering system. Each container was then attached to a continuous buried loop 1/2 inch water supply PVC pipe which intern is supplied with water from a single standpipe with check valve and a pressure gage. I want to talk just a bit about the check valve. Texas law mandates that any time you hook up to a potable water source a check valve must be installed. There are times when it is possible for, in this case, water to siphon from the plant container in to the water supply system and end up in your iced tea. 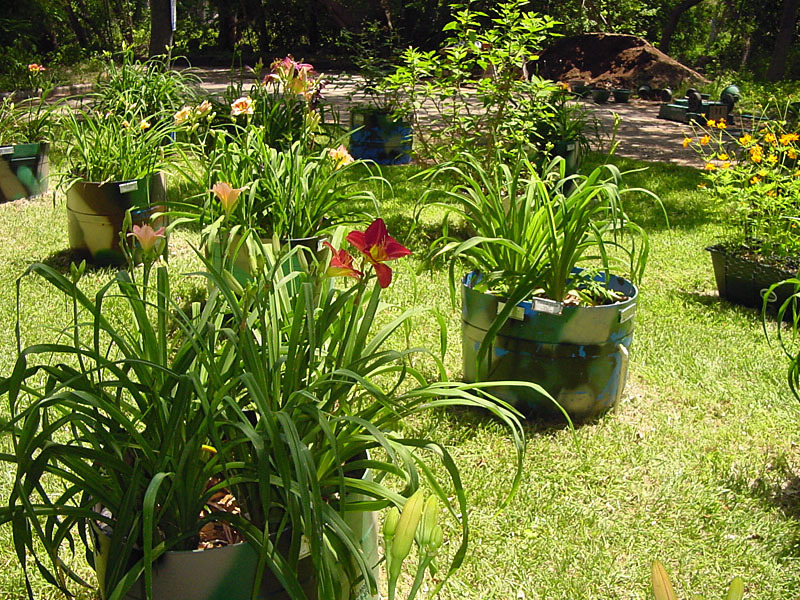 It is a delight to operate the watering requirements of the containers. 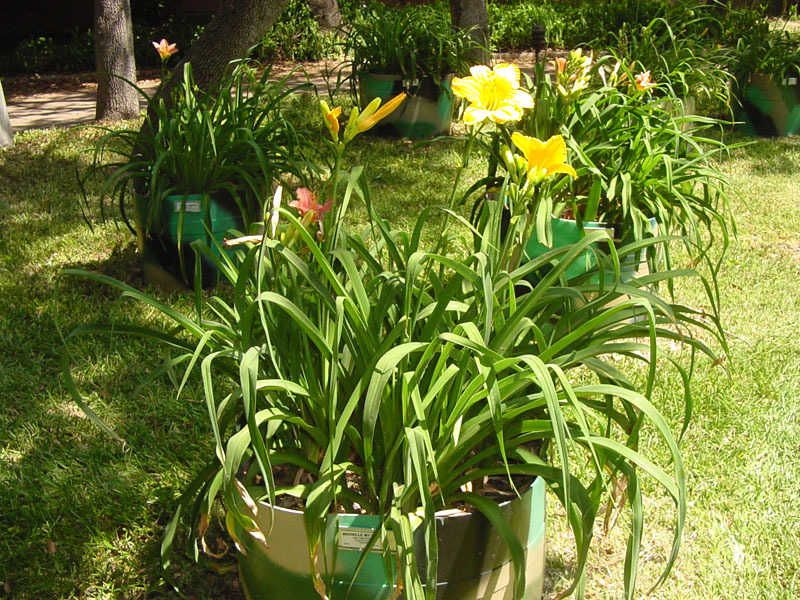 As we are primarily caring for daylillies all containers are watered at the same rate. This could be modified using resistors so some get more water than others. The water is turned on at low pressure, 10 pound per square inch PSI and turned off when the water requirements have been met. A water wand takes the guess work out of when to water and should always be used. One item that we were concerned with was internal temperature of the barrel soil. On the day, in San Antonio, that it was 111 degrees the barrel temperature at daylily root depth was 92 - within normal limits, at least for this part of the world. Daylilies grow in Main so we were not worried about cold. Each container was filled with ROSE MIX from Gardenville. First we placed some locally available rocks in the bottom of the containers. 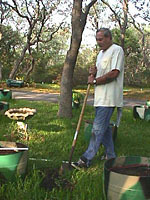 To reduce the amount of soil needed to fill the containers. The rose mix, this year, this batch, is wonderful. Sand, some clay, compost and finally ground cedar (juniper) it stays soft and pliable and easy to plant, by hand. Martha Montgomery, a charter member of the SADLS would call it "sugar and cream dirt". So far this mix is holding moisture well, with out being soggy. 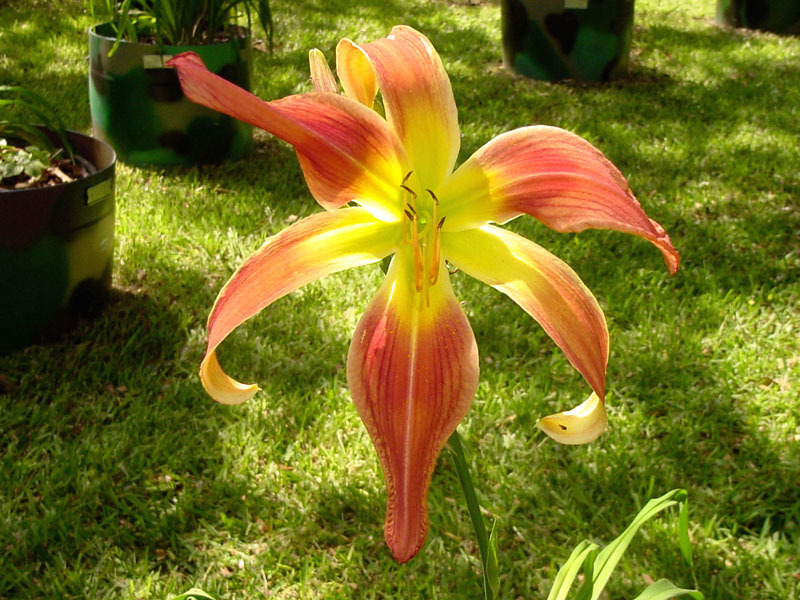 Many of the daylily growers discard their soil in seedling beds annually. This would be easy to do with the barrels. The best part is that the some eighty plants planted in late August are all surviving with no crown rot or any other problems and this with the fact that they were shipped during the hottest time in our history, and looked it on arrival. The proof will be, how will all this look next May. On a personel note, those of you familiar with our garden may remember that our original layout included circular plots the were some 25 feet in diameter. As time went by and I got older the newer beds were designed to be no more than 6 feet wide. This allowed me to sit on the edge and reach in 3 feet on the side for weeding, grooming etc. Now I have difficulty walking and this is certainly true on uneven ground. Walla! I drive my trusty scooter up to any one of my new forty-nine gardens and have a ball. 50 Barrels 11.5 ft Square.